PerryGolf proudly partners again with Azamara Club Cruises for this exceptional 9 night, 4 round golf voyage including some of the Mediterranean’s most beautiful islands onboard the outstanding 690 guest Azamara Journey. 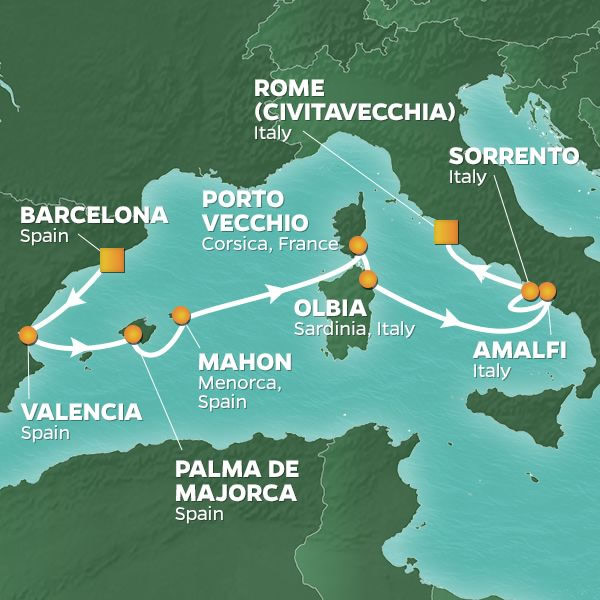 We begin in Barcelona bound for eight captivating ports including Valencia, Majorca, Menorca, Corsica, Sardinia, Amalfi, Sorrento and finally, Rome. Our golf includes four rounds at the highly rated courses of El Saler, Son Gual, Pevero and ... Read More. Sperone Golf Club. The latter three have the added charm of being island venues where our visits are superbly convenient via our floating boutique hotel! Barcelona, the third most visited city in Europe, is a enchanting starting point for our journey because of its excellent food, weather, beaches and nightlife. Valencia features gothic cathedrals and modern amenities, Amalfi is a quaint town with a thrilling coastline and our journey ends in Rome, one of the world’s most interesting cities. The golf portion is also fascinating. El Saler sits along coast on rolling terrain, dotted with pine trees. Sperone Golf Club draws comparison to Pebble Beach and Cypress Point on the Monterey Peninsula. Son Gual opened in 2007 to outstanding reviews while Pevero is a Robert Trent Jones design along a jagged coastline. Azamara Journey is a mid-sized luxury vessel nimble enough to access smaller ports yet large enough to provide every amenity you expect from fine dining and live entertainment to a full-service spa. Forty-four suites are available with English butler style service which routinely book early. Particularly enjoyable about a PerryGolf / Azamara cruise is how the schedule will include many extended stays in port plus the occasional overnight which permits a truly immersive experience. Better still, Azamara Club Cruises are inclusive of a full selection of beer, spirits, soft drinks, bottled water, specialty coffees plus wine with lunch and dinner along with gratuities for housekeeping, dining and bar staff. Every aspect of the golf program is managed by PerryGolf staff onboard and ashore. Your clubs will be waiting your arrival at the golf course. Tee times and pairings will be posted the night before. Casual competitions will be arranged and prizes awarded. Lunch is included while you play plus there will be an open bar at the clubhouse when you finish. Carts/caddies, transfers, local taxes, service charges and gratuities (excluding caddies) are included. The guest list will number between 40 and 60, most of whom are golf couples although it’s common to have non-golfers who will enjoy themselves as a luxury cruise guest starting with Journey’s fabulous facilities along with a wide selection of Azamara Shore Excursions®. The “2020 Mediterranean Islands Golf Cruise” is a full-featured vacation and a unique opportunity to enjoy a yourself in the company of like-minded new friends! Embark Azamara Journey beginning at 1:00PM. All aboard by 4:30PM. Welcome Cocktails & Briefing this evening. Meet your fellow participants. Barcelona is the 11th most visited city in the world according to MasterCard’s 2014 Global Destinations Index and 3rd most popular in Europe behind London and Paris. There’s a lot to like in this Olympic City (1992) from the food to the beaches, the weather and the night life. For many visitors however Barcelona is about architecture, especially the work of Antoni Gaudi. His Sagrada Familia in the city center is astounding. Construction began on the church in 1882; it is scheduled for completion in 2026 on the 100th anniversary of Gaudi's death. Azamara ships will almost always dock at the foot of Las Ramblas just steps from the Christopher Columbus statue. You will literally walk off the ship and into the city. No taxi required! VIDEO of how Sagrada Familia will look in 2026. GOLF: El Saler is located on the outskirts of Valencia within the Albufera Nature Park. Designed by Javier Arana, one of the most prestigious Spanish designers and opened in 1968, it sits nearby the beach occupying terrain dotted with pine trees and sand dunes and has a distinctly “links” feel. Its famous "cats claw" (not dissimilar to the Monterey Peninsula’s “iceplant”) is certainly to be avoided in the rough. SIGHTSEEING: Valencia has come a very long way since 138 BC when it was founded as a Roman colony. Today it is Spain’s third largest city after Madrid and Barcelona. It has one of the world’s most prosperous local economies. The story you’ll probably take home however is about one of the most striking ranges of architecture imaginable. Of course you’ll find antiquity in many forms such as Valencia’s Gothic cathedral which was built over a mosque after the Christian reconquest of 1238. You will also find the space-age City of Arts and Sciences, a massive project by neofuturistic architect Santiago Calatrava (World Trade Center Transportation Hub) whose showpiece is Oceanogràfic – one of the world’s biggest aquariums, with polar zones, underwater tunnels and an underwater restaurant. The juxtaposition is startling. And you’ll have two full days to immerse yourself in it! Enjoy Valencia on your own or via Azamara Shore Excursions®. GOLF: Son Gual has been lauded since it opened in 2007. The Thomas Himmel designed layout is considered the finest of the Balearic islands and is one of the most talked about venues in southern Europe, with the European Golf & Travel Media Association naming it as 'The Discovery of 2010'. Son Gual enjoys a lovely location, peppered with mature olive trees and wildflowers, with its design and conditioning being of the very highest standard. SIGHTSEEING: The original city of Palma dates back to Roman times; modern day residents of the old quarter are still digging up artifacts in their gardens. Balanced on a seawall above the marina is the amazing gothic Cathedral, icon of the city, with some of the world’s largest stained glass windows. Also high on the artistic scale is the Museum of Contemporary Spanish Art featuring works by masters including Picasso, Miró, Gris, and Dali. Mother Nature’s aesthetic achievements can be found in the Caves of Drach—mystical caverns where the play of shadow and light on the rock formations stimulates the imagination. Enjoy Palma on your own or via Azamara Shore Excursions®. Your arrival by ship is fortuitous as Mahon is most striking when approached by sea, perched atop a cliff overlooking the natural harbor. Shops cluster along streets between two plazas, one large and lined with cafés and restaurants, the other tranquil, and site of the Church of Santa Maria, known for a celebrated organ with four keyboards and more than 3,000 pipes; and Carmen, a convent whose cloisters now house the municipal market. Enjoy Mahon on your own or via Azamara Shore Excursions®. GOLF: Sperone Golf Club. Europe’s “Pebble Beach” is yet another RTJ masterpiece in the region situated on yet another spectacular site perched above the striking blue Mediterranean. Sperone has been ranked as high as France’s 6th best course. SIGHTSEEING: Dating back to the 16th century, the fortified port town of Porto-Vecchio is now a Corsican resort destination. The Old Town district—with its cobblestone streets, charming buildings, and ruins of the ancient citadel—features fashionable shops, boutiques, and cafés while Porto Vecchio’s modern marina offers ferry rides to Bonifacio and the Lavezzi Islands nature reserve, plus a variety of places to enjoy a local beverage harborside. Visit the Church of Saint Jean-Baptiste, the Bastion San Antonia, and the Porte Genoise Gate for panoramic views of the sea, mountains and surrounding valley, or enjoy an afternoon at one of Corsica's two most famous beaches, Palombaggia and Santa Guilia, located just south of Porto-Vecchio. As dusk settles, head to the Old Town’s Place de la République (main square) for its lively nightlife, bars, and restaurants. Enjoy Porto-Vecchio on your own or via Azamara Shore Excursions®. GOLF: Pevero Golf Club. The site of Sardinia’s first golf course – along the rugged, ragged coastline of the peninsula between the Bays of Cala di Volpe and Volpero – lured the esteemed Robert Trent Jones for one of his earliest projects overseas. SIGHTSEEING: In a desirable location on the stunning Costa Smeralda, Olbia has been inhabited since the 8th century BC, but a recent archaeological discovery of 24 shipwrecks - two of them from the age of Nero - has landed it in the spotlight. The name Olbia means "happy town", though its past has been somewhat difficult with the city destroyed and rebuilt many times throughout its history. Of course that makes it all the more interesting, as every empire that came and went has left something of value behind for you to see. Enjoy Olbia on your own or via Azamara Shore Excursions®. Today it’s time to relax and reset. Make your reservations early for The Sanctum Spa, a world-class wellness facility offering a full range of health, beauty and restorative treatments. Complimentary fitness and nutrition classes are available along with a fully equipped gym on Deck 9 offering magnificent sea views. There’s room for everyone on the Pool Deck both in and out of the sun. Service to your lounge chair is available from The Pool Bar where the attentive staff is always ready to offer an inclusive cocktail, beer, bottled water, soft drink or fresh towel. The Patio restaurant serves casual fare during the day then completely transforms itself into a sit-down al fresco dining experience at night with table linens and candles. Elegant specialty dining is available for beef at Prime Cand Italian at Aqualina. Windows Café serves casual buffet dining with every imaginable choice indoors and out at the sensational Sunset Bar. This locale requires a camera with lots of memory. Wedged into the mouth of a ravine, encircled by sheer cliffs and facing blue waters, it is hard to believe that this tranquil little town was once a great naval power. Now, terraced hillsides support lemon groves, where the region’s famed limoncello is produced. Taste this delightfully sweet liqueur after a foray along the Amalfi Coast, a thrilling ride snaking along hillsides past unbelievably stunning views of other pastel hamlets perched above the sea. Enjoy Amalfi on your own or via Azamara Shore Excursions®. A warming sun and gentle sea breezes have been attracting visitors to this fair spot for two millennia. Its reputation as a playground of the ancient rich and famous resulted in the building of lavish villas and palaces, an emperor relocated to the Isle of Capri nearby, and over the centuries it has been a haven for artists and artisans, writers and poets, politicians and philosophers, and all manner of aristocrats. The massive eruption of nearby Vesuvius in 79 AD caused considerable damage, but the resulting volcanic ash is responsible for Sorrento’s modern day fertility, thriving olive orchards, and excellent wine. Enjoy Sorrento on your own or via Azamara Shore Excursions®. Disembark Azamara Journey at 9:00AM. El Saler is located on the outskirts of Valencia within the Albufera Nature Park. Designed by Javier Arana, one of the most prestigious Spanish designers and opened in 1968, it sits nearby the beach occupying terrain dotted with pine trees and sand dunes and has a distinctly “links” feel. It’s famous "cats claw" (not dissimilar to the Monterey Peninsula’s “iceplant”) is certainly to be avoided in the rough. Son Gual has been lauded since it opened in 2007. The Thomas Himmel designed layout is considered the finest of the Balearic islands and is one of the most talked about venues in southern Europe, with the European Golf & Travel Media Association naming it as 'The Discovery of 2010'. Son Gual enjoys a lovely location, peppered with mature olive trees and wildflowers, with its design and conditioning being of the very highest standard. Sperone Golf Club Napoléon Bonaparte was born, in Corsica on a Cabell B. Robinson (for Robert Trent Jones) design opened in 1990 that many have called Europe’s Pebble Beach or Cypress Point. In several very memorable spots, Sperone Golf Club is that good. The solid front nine winds through rugged Corsican undergrowth to a number of small raised greens. It’s a short course so you’ll manage but the back nine packs a punch. Eleven plays down toward the ocean and a slender ledge green sandwiched between large boulders. Twelve is a testy 3 par across a rocky canyon to an elevated cliff-top green. Planet Golf says both the 15th and 16th would be all-world holes with a little tree clearing. We suspect you’ll be impressed nonetheless. Pevero Golf Club Sardinia’s first golf course opened in 1972 and designed by Robert Trent Jones. It’s found along the edge of a rugged, jagged coastline in chic Costa Smeralda sandwiched spectacularly between the Gulf of Pevero and the sparkling bay of Cala di Volpe. The outward half plays counter-clockwise; the inward clockwise. While the coastline is never in play, Jones has added several ponds to make water an ever-present danger plus he has wisely afforded generous landing areas so that the course is enjoyable even when confronted by the area’s famed north wind – the Mistral. Azamara Cruises reinvented itself as Azamara Club Cruises in 2007 with the launch of sister ships Azamara Journey and Azamara Quest. A third vessel, Azamara Pursuit, made her maiden voyage in August of 2018 after an extensive four-month refurbishment in Belfast. All three are nearly identical 690 guest ocean cruisers delivering President and CEO Larry Pimentel’s vision to offer a boutique cruise experience with fine dining, entertainment and country club-like ambience. The Azamara experience is built on four key pillars: destination immersion, extraordinary service, fine cuisine and wine, and wellness and vitality. Few cruise lines offer more overnight stays or as many last night departures so that you may experience each destination to its fullest. These three cruisers, with accommodations for 690 guests, offer a sophisticated, yet relaxing atmosphere. Guests will enjoy more inclusive amenities such as included gratuities for housekeeping, dining and bar staff; Spa and Wellness Center; complimentary bottled water and sodas, specialty coffee and teas, as well as complimentary boutique red and white wines to accompany luncheon and dinner; English Butler service for suite guests. Suites on an Azamara voyage. Our suite guests receive a variety of exclusive benefits in addition to comfortable, spacious accommodations. We take care of all the details, so you can focus on experiencing the world. Staying in a suite is like staying in your own vacation home complete with ocean views, sea breezes, and butler service. Relax with plush cotton robes and slippers, French bath products, fresh flowers, and fine linens. Open the sliding glass doors to your private veranda, perfect for reading, al fresco dining, or stargazing. Enjoy a drink from complimentary bottles of specialty spirits, mixers included. And should you need anything, your English-trained butler is never more than a call away, ready to assist with restaurant and spa reservations, private parties, dinners for two, and much more. Sardinia’s first golf course opened in 1972 and designed by Robert Trent Jones. It’s found along the edge of a rugged, jagged coastline in chic Costa Smeralda sandwiched spectacularly between the Gulf of Pevero and the sparkling bay of Cala di Volpe. The outward half plays counter-clockwise; the inward clockwise. While the coastline is never in play, Jones has added several ponds to make water an ever-present danger plus he has wisely afforded generous landing areas so that the course is enjoyable even when confronted by the area’s famed north wind – the Mistral. Napoléon Bonaparte was born, in Corsica on a Cabell B. Robinson (for Robert Trent Jones) design opened in 1990 that many have called Europe’s Pebble Beach or Cypress Point. In several very memorable spots, Sperone Golf Club is that good. The solid front nine winds through rugged Corsican undergrowth to a number of small raised greens. It’s a short course so you’ll manage but the back nine packs a punch. Eleven plays down toward the ocean and a slender ledge green sandwiched between large boulders. Twelve is a testy 3 par across a rocky canyon to an elevated cliff-top green. Planet Golf says both the 15th and 16th would be all-world holes with a little tree clearing. We suspect you’ll be impressed nonetheless. has been lauded since it opened in 2007. The Thomas Himmel designed layout is considered the finest of the Balearic islands and is one of the most talked about venues in southern Europe, with the European Golf & Travel Media Association naming it as 'The Discovery of 2010'. Son Gual enjoys a lovely location, peppered with mature olive trees and wild flowers, with its design and conditioning being of the very highest standard. is located on the outskirts of Valencia within the Albufera Nature Park. Designed by Javier Arana, one of the most prestigious Spanish designers and opened in 1968, it sits nearby the beach occupying terrain dotted with pine trees and sand dunes and has a distinctly “links” feel. It’s famous “cats claw” (not dissimilar to the Monterey Peninsula’s “iceplant”) is certainly to be avoided in the rough. Our prices are provided as Golf Package and Cruise Fare so that your choices for suites and staterooms are clear. The total cost is the combination of both plus applicable taxes. The cruise fare is dynamic and may change until booked and locked in, but you are assured of the best available selection of suites and staterooms and the very best available rates which exist at any point in time. Cruise fares below are the current "from" prices, supplements apply for prime locations within each main category. Your PerryGolf golf travel specialist will assist in selecting the best suite or stateroom for you, and will be pleased to book and confirm both your cruise and your golf package. IMPORTANT : Please review the PerryGolf Travel Insurance. Golf Handicap Limit: The golf courses we play around the world offer varying challenges. Players often require to be of a certain standard to properly and fully experience them in the company of likeminded fellow golfers. We therefore set a maximum permitted golf handicap to participate on our tours and cruises; The maximums are 28 for men and 36 for ladies.